I am continuing with a series of posts about Devexpress controls. You can read the introduction about what are the Devexpress controls, how and where to get them, versioning information and prerequisites in my previous blog post that you can find at this address http://blog.majcica.com/2012/08/05/aspxgridview-master-detail-data-presentation-with-context-menus/. What we are going to achieve in this post is a simple application that will list the credit cards and the amount spent per card per month. We will be able to add in an easy way a new credit card and edit all of the months imports. More, we will be able to add a note on each month and visually see the months containing notes. In this example I will use a database and create two simple tables that will contain all or data. Again, this will be a simple example and it is not meant to be functionally correct. My only goal is to show you how to interact with this controls in order to achieve a certain functionality, which in this case is showing, adding and modifying notes in a similar way Excel does it. The attached project is written in Visual Studio 2012. The express version should be enough. Also you will need a Microsoft SQL Server 2012, Express or and more advanced version will be just fine. The database is part of the project and it will be automatically mounted by VS. You can change this easily be creating your own database and changing the connection string in the web config. Last but not least you will need the 12.1.7 version of DevExpress ASP.NET controls installed on your machine. If you do have a more recent version, upgrading the project should be easy. Check this post about how to get the DevExpress controls and on how to eventually upgrade the project http://blog.majcica.com/2012/08/05/aspxgridview-master-detail-data-presentation-with-context-menus/. At the end the result should be similar to this, however there is much more, so check this post till the end. You can check it also LIVE. Live version persist the data in the session so each new session will reset all the data you have inserted. Also because of this, it is a bit simplified. If you are interested in the code, I can provide it to you, just ask in comments. 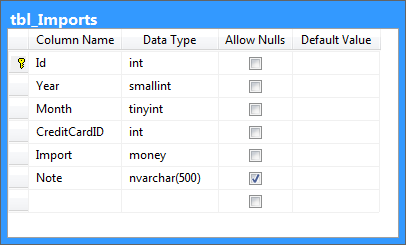 We also need to remember to add the foreign key constrain which we will call FK_tbl_Imports_tbl_CreditCards. Here is the complete SQL script that will do the necessary. We will also add a stored procedure that will help us retrieving data from the database. One parameter will be required, in relation of which we are going to retrieve all the data and pre-format for presentation. We need to retrieve card name, imports and notes for all the months of the indicated year. In order to test our stored procedure and other queries we will insert some testing data. Our data service will be a simple class that will expose several static methods that will help us performing all the CRUD actions. Let’s define them. As I would like to have a combo showing all the years present in the database plus the current and subsequent year, in order that the user can filter the list by this values, I will first prepare a method that will retrieve and prepare this data. /// Retrives all years from the imports table. /// Adds if missing the current year and the following year. /// An ordered list of years. /// Datatable contining the requested data. For this first part we also need to prepare the methods that will manage our notes. Now we are ready to start writing our page. In our site default page we will add an ASPxLabel and ASPxComboBox. First will show the text Selected Year and the second one will list all the years that we will retrieve via GetYears method. Please forgive the usage of the tables for setting up the layout, div’s always bothered me, specially when vertical alignment is in question. Also I will add an ObjectDataSource that will be used for binding. Let’s now define the grid. The longest and the most laborious thing is defining the columns. I will show you the complete code of the grid and then discuss all the properties and events I have used. As you can see, the longest and most tedious part is defining the columns. We defined a column for a card name, one for each month and a column that will show the total per card. Total column is unbound and I we will perform the calculations for this column in CustomUnboundColumnData event. As you can imagine FieldName property is the name of a column in the binded DataTable, Caption is a column header text and ToolTip is well a tool tip for that column header. DisplayFormatString is a formatting string option (N2 is this case formats the value as integral and decimal digits, group separators, and a decimal separator with optional negative sign, with decimal precision of two) and NullDisplayText (when no data is supplied) is set for styling purposes to a slash character. For the card name and total column, we also specified what should be shown when the row is in edit. 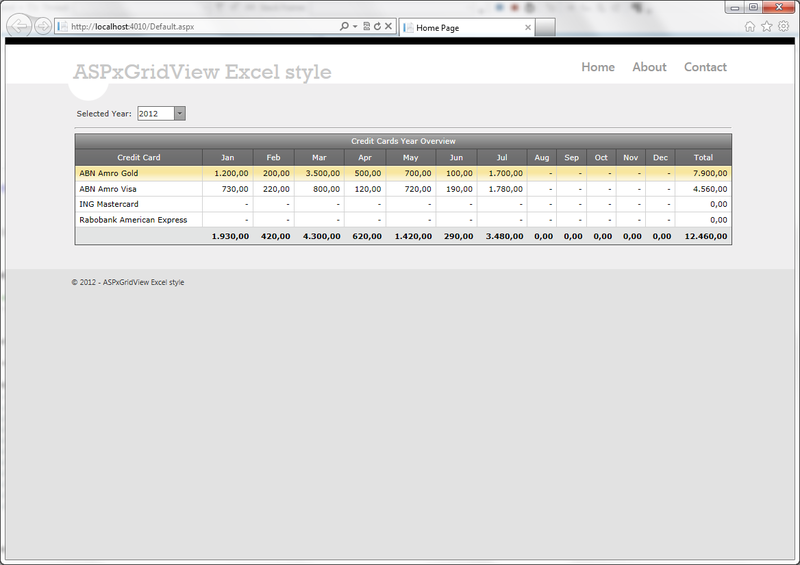 A TotalSummary feature from the ASPxGridView is used, it will show an extra row and the totals for each specified column. By adding ASPxSummaryItem we are specifying the column that needs to be took in consideration (by indicating ShowInColumn property we are positiong in the indicated column the result of our summay), a SummaryType that should be performed (Sum in this case) and a field on which the calculation should be based. We set some properties on the grid so let’s check what is the behavior of these settings. SettingsPager mode ShowAllRecords basically disables the pager meanwhile the SettingsEditing mode Inline sets the editing mode to inline. 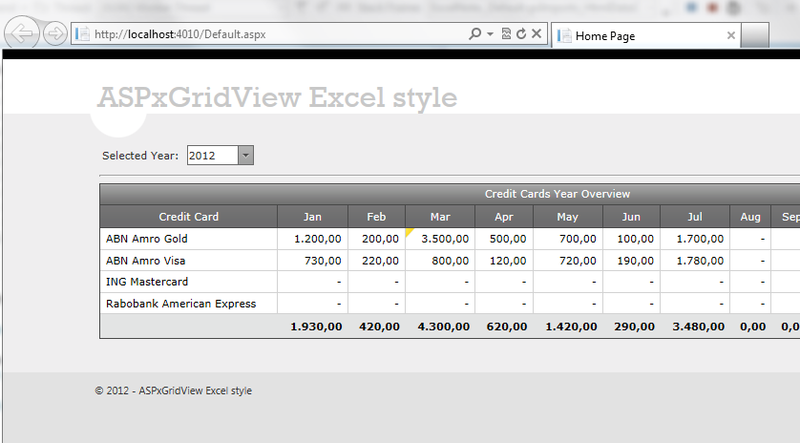 We also decided to show a Footer (necessary for Summary row) and to show a title panel, an extra row on top of the grid that will show a specific label, at example the meaning of the data that is shown in the grid, which we later set to “Credit Cards Year Overview” in SettingsText Title property. Also we disabled the Drag and Drop on columns (re-orderable columns feature of ASPxGridView that is not desired in this case), disable out of the box sorting feature feature and enabled a row visual tracking (EnableRowHotTrack makes the row that is under the mouse cursor highlighted). In order to perform a custom calculation for our Total column we defined the CustomUnboundColumnData event. This is his server side implementation. The even argument helps us by putting on our disposition the column name that he is processing at that moment, so only if he is processing a desired column we assign that columns row value to a sum of all months columns values. If column value is DBNull.Value then zero is used, else a column value is converted to Decimal and then summed. It is time to bind our grid and check the result. 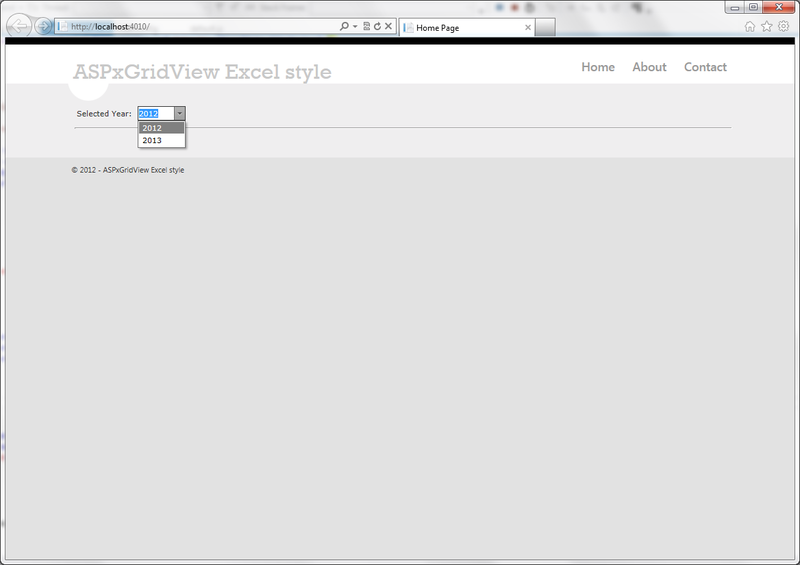 I choose to use the DataBinding event in order to assign the right source to the grid. Before indicating the designed method to the grids DataSource I will check the parameter and if for any reason it is not indicated in the ComboBox I will set it to the current year. The effective bind method will be called from the Page_Load event only on first show (and not on postbacks). Now we can run our code and check the result. Pretty neat and nice result for a relatively small effort, isn’t it? First line of code is a shortcut, which says that if the cell we are processing is in the Name or Total column (columns that can’t contain notes) or if CellValue is empty, we can stop processing it. As our DataSource contains extra columns that contain notes, the name of the column is N plus the number of the month column to which it is associated to, we can easly establish the name of the column by checking the current processing items column and request the note by e.GetValue method in which we will pass the name of the Note column we are searching the value for (at example if we are processing the January column which is called 1, we will search on the current processing row the value of the column N1 which will eventually contain the note. Now if the note is not DBNull.Value and note is not null, we will add the processing cell style attributes background-image and background-repeat to desired values, for the first one the image we chose and for the second one the repeat behavior (which in this case should not repeat). The result is that all cells that contains a note do have a different background and they can be quickly spotted by the user. Well most of the properties are self explanatory, I just added an ASPxPopupControl and as his content I added a simple ASPxLabel control. Notice that I assigned a specific client instance name for the ASPxPopupControl control in order to call the methods and properties on client side with ease. This code maybe seems a bit complicated and tricky, so I will try to explain it. When a mouse gets over the interested cell, the ShowPopup method is executed. We will set the text of the lablel control that we just add in our ASPxPopupControl and close any eventually opened pop-up windows (just to be sure). Then a flag reservPopup is set to true (this is used for controlling the time out, in the case that a mouse cell gets out of the cell, this flag will be set to false, it means that if the showing a popup was requested and the timeout is not yet expired, the popup will not be show, basically if you were quicker than the given timeout triggers the Show function on window) and a function is scheduled for the execution in 1000 milliseconds. This function will check if it should show the pop-up with the note and if so it will call the method ShowAtElementByID of our ASPxPopupControl. string htmlEncoded = Server.HtmlEncode(note.ToString()).Replace("n", "
break row in this case). Also as the ShowPopup functions second parameter we will pass the cells client ID so the pop-up can be shown next to the cell. Now we can run and test our code. As another requirement it will be nice to show a popup menu on the right click of any cell and propose to Add, Edit or Remove the note from that cell. It is interesting and we will jump on work straight forward by defining an ASPxPopupMenu with the necessary items. Inside our ASPxPopupMenu we defined three menu items, one per each specific information we are going to perform. We also assigned a menus ClientInstanceName and a client side event ItemClick implementation of which we will see later in text. What we now need to prepare is the interface that will be used for Adding and editing notes. We are going to define another ASPxPopupControl controls and define it’s content. Popup is set in a similar way as a previous one, the content only contains different controls. You will see that I used a ASPxMemo control which is very similar to a multiline text box, and two buttons. Non of these buttons causes validation or generates a post back on click and both have an client side event associated to their client side click event. Let’s check first the the implementation of the ASPxPopupMenu client side events then we will check the rest. Let’s get back on the last item of the ASPxPopupMenu and write down and explain the code. 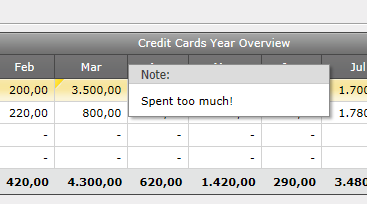 The idea is to show a confirmation dialog before deleting a note. I will now create a dialog that will be reusable even later, for other entities. First method is self explanatory, on cancel click call Hide method on popup control. Second method also as first thing hides the popup then for the specific caller executes a callback with in arguments the command that should be performed, selected item’s visible index and column name. If no parameter is specified, ignore the callback. Split the string by the separation character that I used for convection for separating different values in a string. If the retrieved array contains more then one element, aain by my own convection it means that the second parameter indicates a visible index value as long the first value, that indicates the action to perform, isn’t ChangeYear. In this case the second value is indicating the year on which the grid should be bound. If the array contains more than two values then the third value indicates the month and here it is what really the currentFieldName that we were passing is. Now, once I have all the data, I can check the command and perform the desired action. All the calls to the database were already written down on the start, so I do not need to do more than just call a specific method od the DataService and pass just decoded parameters. Easy? Clean at least (I hope so). As you can notice I added a new attribute on the cell, oncontextmenu, and associated to it a client side function OnCellContextMenu. This client side function that we are going to specify, requires several parameters, the event, rows visible index, column name, indication if the field contains note and as the last one if the cell contains a value. All this information will be useful when we are going to decide what to show and later on for having all the necessary data in order to execute the operations. We are setting this attribute in three different places, for three different types of cells. The first one is for the cells that has no value and on which there should not be show the context menu. We will handle this on client side, however this is necessary for future improvements that you will see in my next blog post. Then we are assigning the same to all the cells that contains a note and all the cells that doesn’t however with different parameters. Client side function looks like this. Well we are persisting the visible index and field name in variables that are globally accessible, so we can use them later. Now we will hide or show different menu items base on what are actually the operations that we can perform. If the cell already contains an note, we can modify the note or delete it, otherwise if the cell has a value but doesn’t the note we can only add a new note. This basically explains the next three lines of code as them translate that into the code. Now we will determinate the windows event as it is handled in a specific way on different browsers and then prevent this event and bubble by using a helper method that is available in DevExpress client site framework. This event determination is necessary in order to make the popup menu work properly on all major browsers of today. And the last important thing is showing the menu itself. We will show the menu only on cells that has a value and we will achieve that by calling a ShowAtPos method and calculating the right coordinates again via DevExpress framework helpers. That’s it! Let’s run our example and test it. The following screen is what you should see once you try to add a new note. As you saw in other occasions we are making a callback on the ASPxGridView and passing a command parameter and the newly selected value. You can find the source code of my project for download here. You can find a trial version of the requested controls here. This is it for the first part, if you have any question, feel free to comment. I will use this example as a base for the following blog post in which I will extend the functionalities by introducing inline editing, CRUD operations on credit cards, export and more, so stay tuned! Cool. I like it, you gave it step by step. So the novice can go along with it.